I had a tragic french fry situation yesterday. It was really disheartening and made me realize that I have high standards and expectations when it comes to the standard side item. 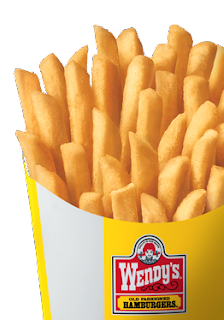 Here's my thing: everyone has their own french fry preference. Mine is crispy. I like crispy fries. The fast food places that fit into this category are: Whataburger, Wendy's, Sonic, and sometimes Burger King. The only other non-crispy fry places that I will tolerate are Chick-fil-A (because, hey, I enjoy me a waffle fry...sidenote: I don't like the waffle fries that are not totally see-through... you know what I mean? If I hold a waffle fry up to my eye, I wanna be able to look through it and see through it. It's important. That's what makes them cool. ), and Fuddruckers. Fuddruckers has the wedges that you can dip in the melted cheese. I'm all about that. I do NOT tolerate soggy, wet fries. Also, any kinda of french fry that is totally beyond salty is off my list. Translation: McDonald's. NO THANK YOU. Also, I would rather my fries not be brown. Yesterday I was CRAVING some crispy fries from Wendy's. I left work and I couldn't find a Wendy's anywhere. I called Grant at work and he googled one for me. I drive WAY out of the way and finally find one. "Wendy's, can I take your order?" "Yes, I'd like a Number 1 with cheese, plain and dry, JUST CHEESE MEAT AND BREAD, with fries and a Diet Coke"
I drive up. Precious had some flourescent orange nail polish on, but just on the tips. I mean, it is summer. They gave me a Diet Coke that was clearly not a small. They were just certain it was though. I stopped fighting it, since I had already duct-taped shut the mouth of my guilty conscience angel hanging on my shoulder. More diet coke = more joy. As I drove away, I dug my hand around inside the bag to find my first fry. My mama always taught me that refusing to eat french fries in your car is just un-American. And being that it is almost 4th of July, I didn't wanna seem unpatriotic. I was shocked and appalled to pull the fry out and see it bend over in two. SOGGY FRIES!!! from WENDY'S!!!! I still ate them though. I mean, it was lunchtime. I was hungry. you so crack me up...love the summer comment. i think you should try cheesy-tots from buger king. you will thank me later. that is sad! I prefer Whataburger, personally. And with Whataburger ketchup (the "dip-it" kind as T calls it), driving and eating Whataburger fries is kind of a safety hazard. Oh well. You do what you gotta do!